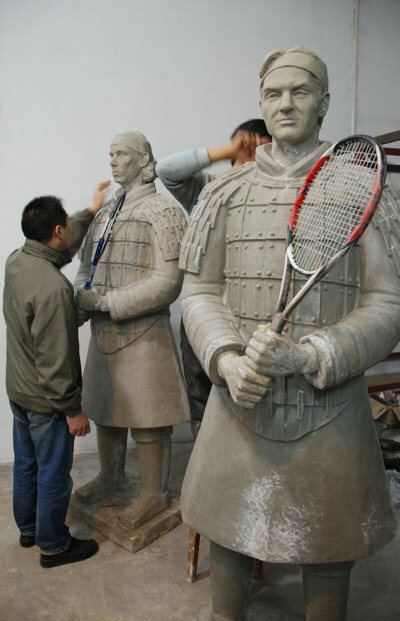 Shen Xiaonan along with fellow Chinese sculptor Zhang Yaxi and French sculptor Laury Dizengremel created the Tennis Terracotta Warriors (Wanqiu Bingmayong) sculpture series for the ATP / Tennis Master Cup Shanghai 2007. Click here to see it large! 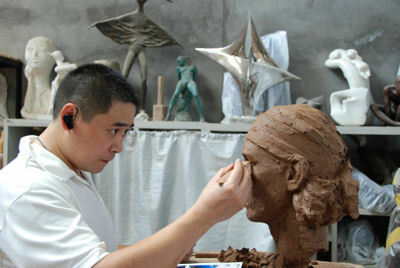 (Above) Shen Xiaonan working on the clay bust of top tennis player Rafael Nadal for the Terracotta Warriors of Tennis in his Tank Loft Contemporary Arts Center studio, adjacent to the Sichuan Fine Arts Institute in Chongqing. 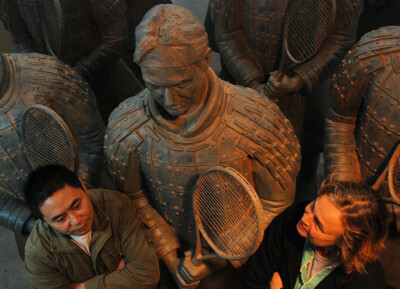 (Above) Chinese sculptor Shen Xiaonan and French sculptor Laury Dizengremel worked together with fellow sculptor Zhang Yaxi to create the Tennis Terracotta Warrior series. 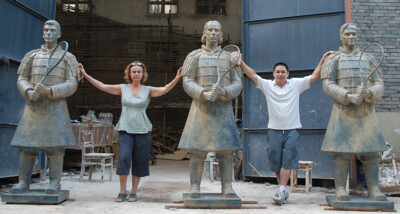 (Above) Shen Xioanan and fellow sculptor Laury Dizengremel with their first 3 Terracotta Warriors of Tennis sculptures. 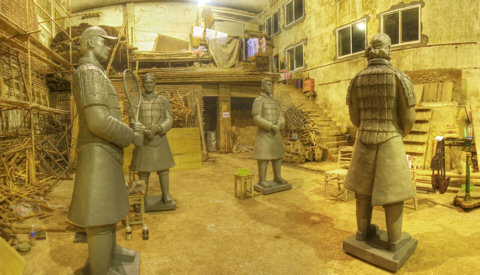 (Above) The first 4 Tennis Terracotta Warriors with only their first patination layer applied. 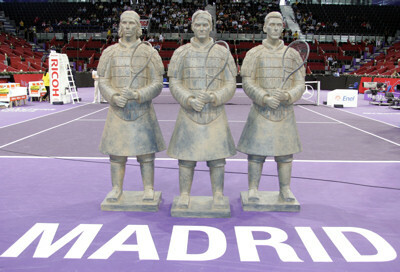 (Above) The first 3 Tennis Terracotta Warriors were flown to Madrid for the Mutua Madrilena Master Series event there in October 2007. Shen Xiaonan was unable to attend as he was continuing to wok on the series in Chonqging. 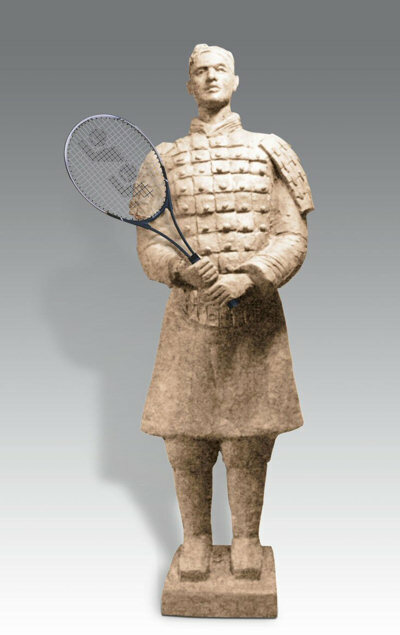 (Above) One of 3 small rough maquettes (sculpture studies) made by the team of sculptors in June 2007 - this one by Shen Xiaonan and Laury Dizengremel was selected for the final larger than lifesize Tennis Terracotta Warrior series of 8 sculptures (although the tennis racquet was changed to the be held to the right rather than the left). 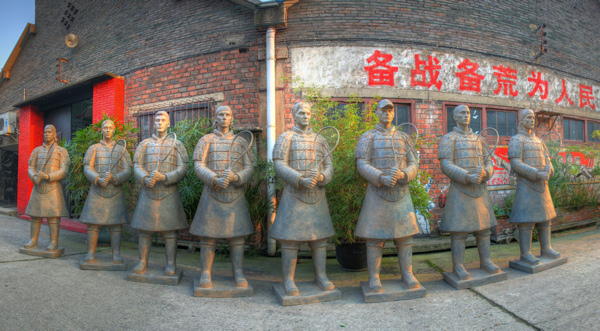 An image created by David McBride of the 8 completed tennis warriors before they left Chongqing where we created them in our Tank Loft Arts Center studios. Click here or on the image itself to see this a larger view. 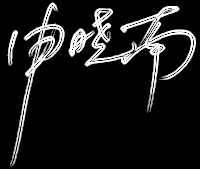 And to contact Shen Xiaonan please send E-Mail. 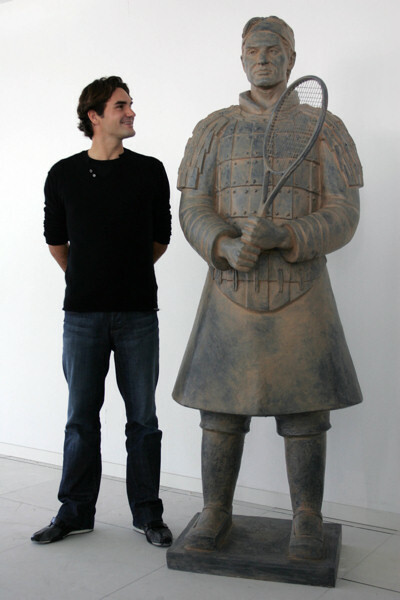 Please note: since all visual records for this project officially belong to the ATP, Shen Xioanan is grateful to be able to use them here and requests they not be downloaded or used without the express permission of the ATP.